This is chocolate mint heaven in a bowl. 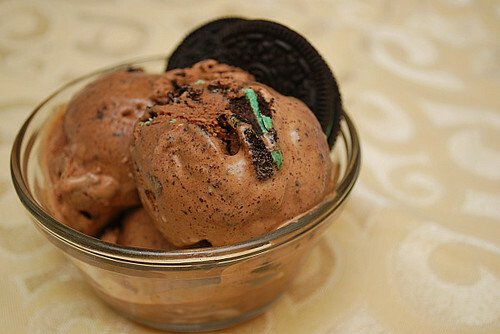 Oreos filled with minty cream finds it's way in decadent chocolate ice cream that's been kissed with more mint. I used a chocolate ice cream recipe from Ben & Jerry's and substituted peppermint extract in place of vanilla extract. Having that mint flavor in the ice cream only enhanced the minty Oreos... delish! Melt the unsweetened chocolate in the top of a double boiler over hot, not boiling, water. Gradually whisk in the cocoa and heat, stirring constantly, until smooth. (If the chocolate clumps or "seizes", don't worry - the milk will dissolve it). Whisk in the milk, a little at a time, and heat until blended. Remove from the heat and let cool. Whisk the eggs in a mixing bowl until light and fluffy, 1 to 2 minutes. Whisk in the sugar, a little at a time, then continue whisking until completely blended, about 1 minute more. Pour in the cream and vanilla, and whisk to blend. Pour the chocolate mixture into the cream mixture and blend. Cover and refrigerate until cold, about 1 to 3 hours, or even overnight. Transfer the mixture to an ice cream maker and freeze following the manufacturer's directions. During the last 1-2 minutes of churning, add the chopped Oreos to mix into the ice cream. Remove from the ice cream maker and store in a freezer safe container. Freeze overnight to meld flavors and serve. Makes 1 quart. What a fantastic idea!! Your ice cream looks amazing! I love the focus on this shot. That looks so good. I love the combination of mint and chocolate. Now I want ice cream. It was a hit with my whole family!